Ah, Beautiful February, that short little month that lets us know for sure last year is definitely over and the new year is rolling swiftly into being... And of course it's Valentine's Day where mainstream mass mind images of romantic love get plastered all over consumer culture. We can become blinded by that cultural image or use the endless HEARTS and XOXO signs as divine reminders pointing us towards whatever heart intentions we are holding now. Chinese New year is also celebrated mid-February (two days after V-Day), with the lunar calendar. So, by many, February is considered to be the true entrance to the new year, marked with its own unique energy cycle. No matter how you view it, February holds rich opportunity for us to recalibrate the heart by making peace with the past and practicing steadiness in embodying the intentions we have for our growth to come. For me, February is a fertile practice month, filled with lots of heart opening yoga, journal writing to clarifying my intentions, meditation, and work towards my personal and professional goals. (Click here to access heart opening yoga poses with Aviva Levine. Aviva is one of the most skilled yoga teachers I know in the Bay Area and now through her Breathe In Love YouTube channel you don't have to be a Bay Area local to learn form her!). You might be reading this blog and thinking, huh, now what's all this heart-opening and yoga talk got to do with food, Jennifer? ... Well, dear one, truly...everything. Food is just one aspect of nourishment. Our heart is the root of our emotional nourishment which is intimately connected to how we eat. Often we cross-wire our habits and our actual needs; we try to feed ourselves emotionally through food or another substance, when what we really need is Love -something that directly nourishes us physically, emotionally, spiritually -we need that love soul food. All the yoga, meditation, and heart practices are tools that can help us to uncross those wires and strengthen our ability to listen and give ourselves what we really need. So, rather than getting emotional and overeating chocolate on Valentine's Day as a way to recover from any stories of not-enough-ness you may be telling yourself about your life on Valentine's day...I'm inviting you to have this deeper, more heartfelt heart-to-heart with YOU, and whomever else is part of your heart tribe. Breathe, laugh, do yoga, be nourished, and of course, since this blog is a recipe blog, I've included my favorite February recipes that would make a juicy Valentines's Day menu. RADISH AND TURNIP CARPACCIO This lovely salad is so easy to make and simply stunning; visually, you are invited to eat a flower. 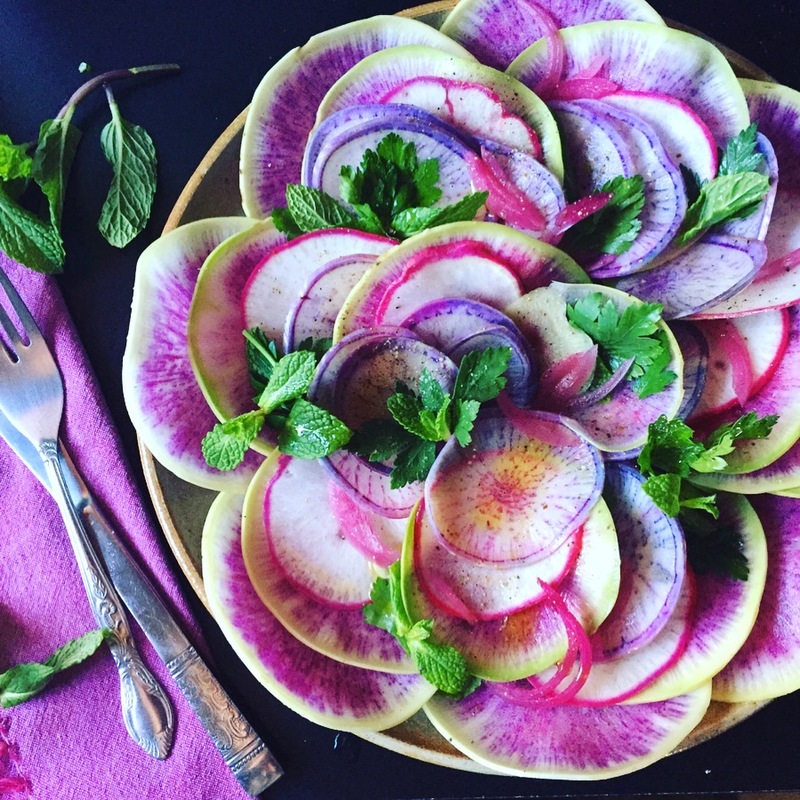 The Watermelon Radish, Purple Daikon Radish, and Scarlet Queen Turnips are delightful to eat raw when sliced paper thin with a mandolin and soaked ahead for several hours or overnight, in a light salt water brine. Another joy of eating this salad is that it's actually fun to eat by hand, each radish and turnip can turn into a little taco bite with the mint, parsley and pickled onion tucked inside. The dressing also adds a nice flavor pop of grapefruit which goes so well with the fresh mint. In addition, radishes are so good for us, they nourish our kidneys, act as a mild diuretic and blood cleanser, they strengthen lung chi (so good for clearing chest congestion) and also have anti-inflammatory properties. Because they nourish the kidneys, they support our ability to have, feel, and use natural life force energy, which in turn we can use for all aspects of living, sexuality and creativity. All in all, I think this salad is a great choice for Valentine's Day, Mother's Day or any menu that calls for something light, crisp and naturally flavorful. Enjoy. 1 purple daikon radish, "
1. Wash and scrub radishes and turnips. Use a paring knife to remove any coarse, dirt-filled, or bruised parts. Using a mandolin on the thinest setting, slice each radish and turnip into thin rounds. Place veggie rounds in a bowl or glass storage container (a mason jar would work nicely as well), cover with filtered water and several pinches of sea salt (non-iodized salt). Leave veggies in brine for several hours or up to three days. When ready to use, simply drain off water and let dry. 3. In small bowl, whisk dressing ingredients together to emulsify. Let sit while arranging salad plate. 4. Artfully arrange salad to your creative appeal, adding in the fresh herbs and pickled onions. Dress and serve. Enjoy. HEART BEET SOUP This recipe is so simple you'll have your beautiful beet red soup together in about 20 minutes. The recipe was inspired by Julie Morris' Superfood Soup (I highly recommend this fun and easy cookbook). In addition to beets, of course, I've added cauliflower to give it creaminess and mellow out the sweet and earthy beet flavor. Miso and Meyer Lemon add a nice rich umami contrasted with the brightness of the citrus. The addition of cashews to the miso broth base also adds creaminess and a heartiness to the soup. If you have a cashew nut allergy simply leave out. Alternately, if you wanted to bump up the thickness you could add a small potato or a white Japanese sweet potato if you need to eat nightshade free. This soup is great with different garnishes. My favorite is any kind of sauerkraut or kimchi. Other options are toasted pumpkin seeds, gomasio, chopped cilantro, plain yogurt or cashew cream. It's a superfood soup because beets are a super blood cleanser and enhance energy and blood flow. 1. Heat oil in medium sized stock pot. Add leeks and a pinch of salt and sauté for 3-4 minutes. Add beets, cauliflower, garlic, thyme, and cayenne and continue to sauté for 5-7 minutes. 2. While veggies are sautéing, add stock, miso, and cashews to a high speed blender and blend until all cashew pieces are dissolved. 4. In batches, transfer soup to blender and add lemon juice and zest to taste. Blend until smooth. Return puréed soup to stock pot and heat gently, adjusting taste as needed. 5. Serve in bowls, garnish according to taste. Enjoy. For easy storage, store in glass mason up to 5 days in fridge. CHOCOLATE MACA LOVERS BOWL Let's be real here people, this February Love Cooking post wouldn't be complete without chocolate, high quality raw cacao mousse, of course. When I was dreaming up this Lover's Bowl I knew I wanted chocolate, pomegranate, and roses. It expanded from there to include maca root powder, which is an energy builder, hormone balancer, and a mood, memory, and sexual health enhancer. (Check, check, check!) This recipe also has chia, raspberry, and coconut, each superfoods as well. This dessert is a great example of a superfood nutrient-dense dessert which packs in tons of flavor and feel good ingredients without refined sugar. It's also dairy free. There are several components to the dessert bowl. Depending on the amount of time you have to prepare it, steps can easily be simplified. Enjoy. Procedure. Place soaked cashews, coconut oil, water, maple syrup, and vanilla in high speed blender and blend on high until smooth and creamy. Add in cacao and maca and continue to blend until smooth. Procedure. Place all ingredients (except raspberries) in a small bowl or glass jar and stir until thoroughly combined. Allow mixture to sit for 10 minutes and then stir again. This is best if you let it sit at least one hour for chia seeds to absorb the liquid. You can make this ahead and store in the refrigerator overnight. Stir in the raspberries before serving. Procedure. Preheat oven to 300F. In small mixing bowl coat coconut evenly with rose water, pomegranate syrup, sea salt and cayenne. Spread coconut evenly onto parchment-lined baking sheet and bake for 12 minutes. Allow to cool before serving. Store coconut in glass jar in refrigerator. Best used immediately however. Assembling your bowls: To create your dessert, choose a bowl, a wine glass, a mason jar, whatever you like. Layer in the mouse, the chia pudding, the toasted coconut and fresh pomegranate jewels as desired. Enjoy.